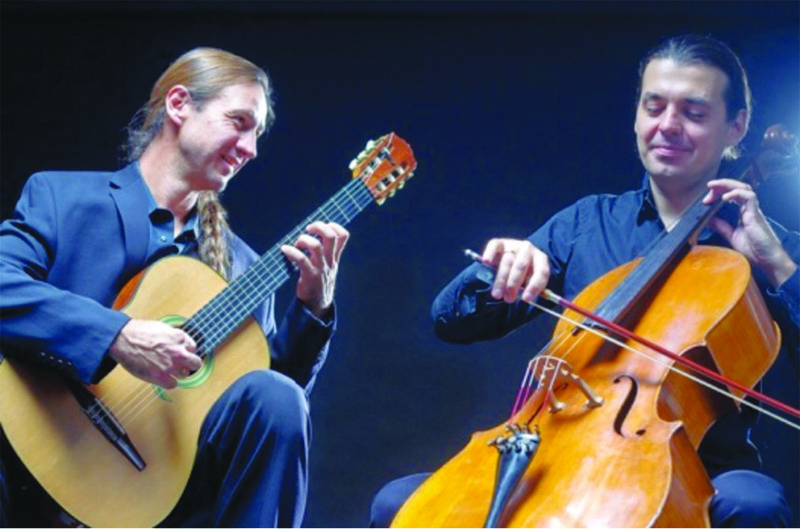 The Griffin Area Concert Association presents the internationally acclaimed duo RichterUzur in concert at the Griffin Auditorium at 7:30 p.m. on Thursday, Nov. 14, 2013. The RichterUzur Duo plays a whimsical mashed-up blend of classical, world, and rock music. Viktor Uzur and Brad Richter are each master musicians of the highest caliber with global solo careers, major international awards and intensive training from two of the world’s most lauded musical institutions (The Moscow Conservatory and The Royal College of Music respectively). While developing into classical virtuosi as students, Brad and Viktor cut their teeth in rock bands – Viktor as an electric guitarist and Brad as a guitarist and singer. They also delved into folk and world music, eventually setting those interests aside to pursue their classical concert careers. Since the “RichterUzur Duo” was founded in 2005 they have discovered a way to blend all of the musical styles they love and audiences have as much fun listening to the results as Brad and Viktor have playing. The RichterUzur Duo has played hundreds of concerts in North America, South America, Europe and Asia and has a rapidly widening circle of communities around the globe that invite them back again and again. In the U.S. the Duo is perhaps best known through its regular appearances on NPR’s Performance Today – North America’s most listened to classical music program. Together Viktor and Brad have composed and arranged the most expansive collection of music for cello and guitar duo in existence, including their Duo Concerto for Cello and Guitar, commissioned by the Jackson Symphony in Michigan and premiered in May 2012. Single tickets for this performance are $20, with all children admitted free when accompanying a paid adult. A special group rate of $15 per ticket is available for groups of 10 or more. Season tickets for the remaining four concerts in the 2013-14 season may still be purchased for $60. For more information visit http://www.griffinconcerts.org or call 770-228-3229. « Food Depot: tentative agreement reached to open second store on S. Hill St.